Before we dive into details, it’s helpful to note that Google Analytics data is organized into 3 top level categories that we’re going to explore in this article. Audience – this section provides information about the number of visitors to your site, the number of pages they visit, the average time they stay, and how many are new versus returning visitors. You can also drill down into more detailed information about demographics (age, gender), where they’re located, and what technology they’re using (desktop vs. mobile or iOS vs. Android). Acquisition – this provides insight about how visitors are finding your website. Major categories include search, social, email, referral, and direct traffic. Behavior – in a nutshell, this section provides information about your most popular pages and content. It also provides detailed data about how people navigate through your site, how fast your pages load up, and a section called “In-Page Analytics” that shows you what links people click most often on a given page. 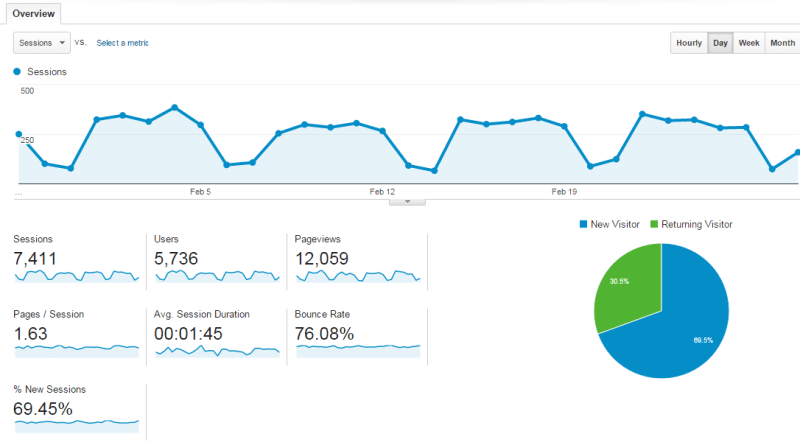 Note About Date Range: when you launch Google Analytics, it displays data over the last 30 days by default. To change to a wider period like 6 months or 1 year, select the dropdown box at the top/Right of the screen to choose a custom data range. 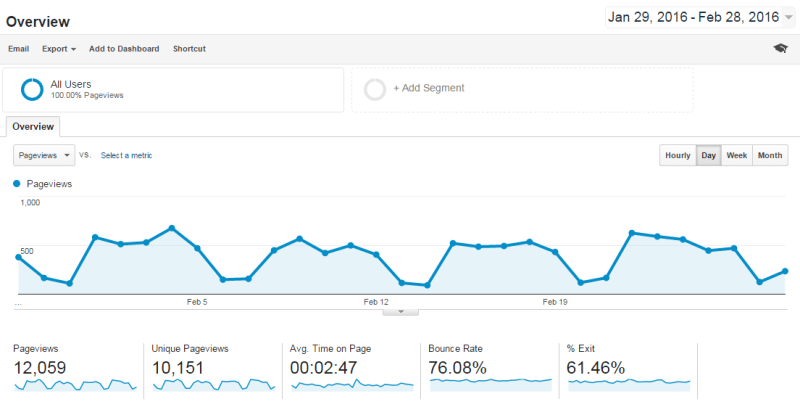 Sessions – the number of visits to your website during the period. Users – the number of visitors to your website. This is to be distinguished from Sessions/Visits because 1 visitor can hit your website multiple times. Pages and Duration – information about the average number of pages per visit, along with how much time they spend on your site (on average). Higher is better in almost all cases. As it relates to SEO, Google likes to see that people are hitting multiple pages on your site and staying for a while which signals to them that your content is compelling and should be favored in search results. Bounce Rate – this is the percentage of single-page visits where someone visits just 1 page and then leaves your website. A lower percentage is better. Similar to the SEO comment above about Pages and Duration, if people are visiting just one page on your website and then “bouncing” back to search results for other options, Google may assume your content is shallow (or off-topic) and not what people are looking for in search results. Geo/Location – where your visitors are located. This can be helpful data if you’re planning on running a paid ad that targets a specific location. It can also be helpful if you plan to target localized traffic with your SEO strategy. Mobile – this section tells you what devices (and operating systems) people are using to access your site. If your website doesn’t render well on certain devices, this data can help you determine whether the audience is significant enough to warrant a website redesign. If your website isn’t mobile responsive, you may discover that mobile users on your site have a higher bounce rate, visit fewer pages, and don’t stay very long. All of which are bad for business and SEO. Organic Search – the number (and percentage) of people that found your website via search results. If you drill further, you can see which search engines they came from (Google, Bing, etc), what pages they landed on, and what keywords they used. In regard to keywords, this data isn’t as helpful as it used to be. A few years ago, Google decide to start masking the actual keywords in order to (according to Google) protect user privacy. The net result is that almost all the keywords people use to find your website are masked and wrapped up in one big category called “Not Provided.” For most, it represents upwards of 80% of the organic search traffic so the data isn’t typically very helpful. Direct – this is the number of visits that either manually typed your website address into their browser or directly clicked a link (in a document or email for example). Social – the number of visits that came over from a social media platform like Twitter, Facebook, or LinkedIn. Referral – the number of visits that were referred from other websites. These are essentially links on other websites that lead to yours (i.e. links from a vendor of yours, a community forum, a press release, etc). Like anything else within Google Analytics, you can really dig into the numbers and reveal some serious detail and insight if you know what you’re looking for. But for many, this section is most helpful in providing insight about what’s working and what’s not when it comes to generating traffic. For instance if you’ve been engaged in big SEO project or running a social media campaign over the last several months, this data can reveal whether any of those efforts are moving the needle. And if they aren’t, you may be either wasting your time or need to change your approach and strategy. Ideally, you’d like a nice distribution of traffic from a variety of sources. Not only does this demonstrate that your marketing efforts are “hitting on all cylinders,” it also prevents you from being tied too closely to one strategy or source of traffic. For instance if 80% of your traffic is from search and Google decides to change their algorithm, your susceptible to a big drop in traffic. Similarly if only 10% of your traffic is current coming from organic search, there’s opportunity that you’re almost certainly overlooking. In other words, the upside potential to grow your traffic is there for the taking with the right data and strategy. Overview – this link at the top of the Behavior section provides a nice snapshot of the number of page views (in total) along with your top 10 pages. To see your top 25, 100, 500, or beyond, simply click the “View Full Report” link at the bottom right. For most companies, the home page, contact page, and about us page will almost always be among the top 10. Outside of that, the top pages may either confirm what you already suspect or surprise you with a page that you didn’t realize was performing so well and driving so much traffic. For instance, do any of your blog posts show up in the top 10? If so, maybe it makes sense to leverage that content more than you have been … or create more blog posts around a similar or related topic because that’s what your visitors are gravitating to. We often use this section during a website redesign to help determine site navigation or home page layout/links. For example, there may be a client who has had an “Industries” link prominently displayed on their home page for years. Yet, Google Analytics data shows that it’s not generating many clicks. Perhaps that space or portion of the website would be better used by something else like Events, Training, or Case Studies. Site Speed – since Google announced a couple of years ago that website speed and page load times impact SEO rankings, there has been more focus on website architecture and site speed metrics. In short, this section provides insight about how your website performs in various browsers (Chrome, Explorer, etc) along with detailed “page timings” that help you identify pages that are slow to load and, as a result, maybe not ranking as well (in search) as they could be. And for those that find pages with a red flag that are slow to load, the handy Pagespeed Insights tool provided by Google can help diagnose and fix the problem. In-Page Analytics – this is an interesting tool embedded in Google Analytics that actually launches a page on your site, then overlays metrics that show which links are most heavily clicked. By default, it will launch your home page. But you can navigate through your site, choose other pages, and see the results on each page. This can help you make decisions about which links are popular and which ones are just taking up space and should be removed or swapped out. The potential of Google Analytics is seemingly unlimited and there’s so much more to discover. In this article, we’ve only scratched the surface and it certainly isn’t a comprehensive or advanced guide. But it should be enough to get you started on your way to making more informed decisions about your website and content strategy. Got any burning questions that weren’t answered here? Feel free to leave a comment below and we’ll do our best to answer. I think this is a valuable tool for an individual taking on Google Analytics for the first time. You did an excellent job laying out the information, making it easy for anyone to understand. Very informative, well written, and engaging Mark. 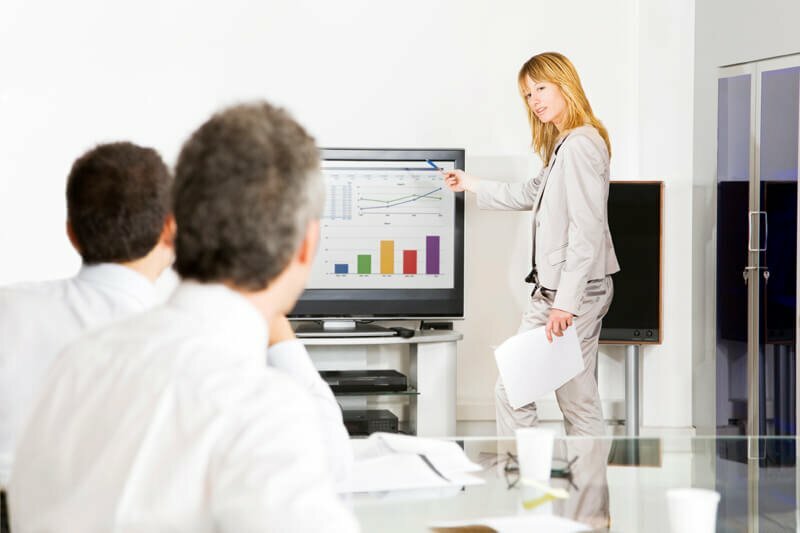 You did a great job of tying in real life examples of how to use the data in practical terms and guide us toward improving the overall performance and ROI of our website. Much appreciated. Thanks Jeff. I’m glad you found it helpful and your comments are much appreciated.